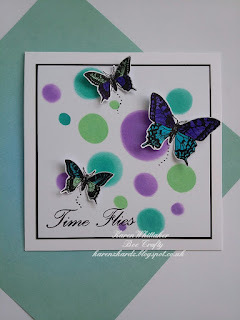 Using Cracked Pistachio, Peacock Feathers and Wilted Violet DO, blend through some of the circles from the Circles Inkable Template. I hope you like these butterflies as much as I do. Thankyou for stopping by and please feel free to leave a comment or ask any questions. Love this, Karen. Gorgeous colours and flutterbyes! Gorgeous, love the background and beautiful butterflies.